In keeping with October’s Halloween theme, this month’s calendar is a monster! But in a good way. The calendar is just bursting with family fun activities at Los Angeles art museums. And that’s not only because there are lots of Halloween festivities, or because October happens to have five weekends this year. It’s also because there are two major art initiatives happening in Los Angeles this month, Pacific Standard Time and The Big Draw L.A. The Getty sponsored initiative Pacific Standard Time (PST) is an unprecedented look at art in Los Angeles from 1945-1980 — this six month program features exhibitions at more than 60 locations. The first weekend of October is the official PST kick-off with special events all over town. There’s even free admission and free shuttles to many participating museums on October 2nd. For families, the Getty Center is hosting a PST Family Festival (10/22). It’s a day full of L.A. art inspired family activities including live performances, artist installations, and art-making activities. The Craft and Folk Art Museum (10/8) and the Huntington (10/22) have creative family workshops highlighting their PST exhibitions, which are not to be missed. Stay tuned to learn about more PST upcoming events for kids, and for parents looking for an artful night out (I can’t wait!). 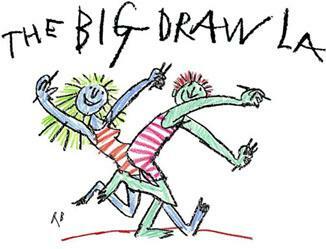 Presented by Ryman Arts, The Big Draw L.A. celebrates the art of drawing this month. With over 30 events citywide, opportunities for family museum drawing adventures abound. Families can create nature collages on the Huntington’s lawn (10/1), construct kinetic mobiles at the Santa Monica Museum of Art (SMMoA) 10/2, make flower power drawings at the Craft and Folk Art Museum (10/8), and draw portraits (10/8) and explore color (10/29) at the Getty Center. And yes, L.A. museums have plenty of Halloween activities planned too. Kids can learn how to perform magic tricks at the Skirball (10/2), make masks at the Norton Simon (10/22), celebrate the Day of the Dead at the Fowler (10/23), and turn pumpkins into art (10/29) at the Huntington And what would Halloween be without monster movies and spooky stories? Hammer’s free family flick this month is the 1966 comedy Munster, Go Home! (10/30). The Huntington has after-school Halloween Tales (10/26) and LACMA has a Halloween interactive storytelling performance (10/29) in the park. Just in time for Halloween family fun, the Getty Museum has new spooky kids iPod Touch audio tour: Demons, Angels and Monsters (see earlier post). Oh, and did I mention it’s free! LACMA’s Tim Burton exhibition (see earlier post) closes on Halloween, October 31st. Check out closing events for Tim Burton inspired spooky activities for all ages. And don’t forget to subscribe to get this calendar every month. FREE FAMILY FLICKS: Munster, Go Home! FAMILY SUNDAY WORKSHOPS: Tim Burton: What a Character! Ages 8-13. Online registration required. Free. Space limited. Advance reservations recommended. Free. Advance tickets available online. All ages. Posted in Calendar Picks. Tagged as Big Draw L.A., children, families, family activities, kids, kids activities, L.A., Los Angeles, Museums, Pacific Standard Time, things to do in L.A.